Injuries are a frequent result of damage by protruding nails or collision with balls, fences or trees, especially in poor light or where the animal has been frightened. Also dog breeds with protruding eyeballs are subject to injuries when crated alone or together with another animal while under stress, traveling or during shipping. If there is any doubt as to the severity of the problem, see or call your veterinarian for help. Cuts may need suturing to avoid distortion to the eyelid. The following remedies offer excellent choices for first aid treatment for a variety of accidents that involve the eye. Details of subsequent problems including conjunctivitis will be included in future posts. Ideally, you would want to choose the remedy that is most fitting to the case (the one that matches the majority of the animals symptoms). Unless otherwise stated, only use 'one' remedy at a time. When appropriate, if you are alternating two remedies, give them at least 1 hour apart. Do not mix remedies together. Generally speaking, in acute first aid, if you have chosen the correct remedy, you should see some improvement by the third dose. A dose equals 1 to 3 dry pilules, given by mouth. Repetition of the dose is based upon the animal's condition. As the animal improves the doses should be repeated less frequently. When the symptoms are gone you should STOP DOSING. Only begin dosing again if the same symptoms return. This is the most useful of all remedies where injury is concerned. Arnica will help limit bruising, pain and swelling and may help arrest hemorrhage where the skin is damaged or cut. Arnica will also assist the healing of wounds. Example Dose: 200c potency, give four doses, initially each dose is given two hours apart, then continue giving the remedy twice daily until healed. Ledum is useful where the eye is bloodshot, bruised or contused. Where Ledum is indicated, discomfort will be relieved > by application of a cold pad to the eye. It is also valuable where there is bleeding into the front of the eye. If necessary, Ledum can be alternated with Arnica. Example Dose: 30c potency, given two to four times daily, until symptoms improve. An important eye remedy particularly where injury is concerned. Assists healing where there is damage to the bony orbit of the eye. This remedy helps to reduce pain and discomfort. Injuries from a blow to the eye from a blunt object will especially benefit from this remedy. Example Dose: 30c potency, given two to four times daily until symptoms abate. This is the main remedy for pain relief and of additional benefit where there are lots of nerve endings associated with lacerations to the tissues surrounding the eye. Hypericum be used alongside other remedies where the relief of pain is of primary importance. Example Dose: 6c potency, given three to four times daily as needed. Use topically to clean any wounds, cuts, lacerations and abrasions. Hypercal lotion will also help stimulate wound healing and reduce bruising. Instructions: Dilute before use by adding a teaspoon to a cup of cold boiled or distilled water. Bathe the affected areas two or three times daily. This is a consequence of severe trauma to the eye and should be treated as an emergency. Check for bleeding into the front chamber of the eye. This will obscure the iris and impair vision. The following remedies can help arrest bleeding and hasten healing. Always remember to administer Arnica in the initial stages of an injury to limit bleeding. In cases pertaining to the eye it will be specifically be indicated where there is retinal hemorrhage. Example Dose: 200c potency, given every two hours, for 4 doses, then reduce the dosing to twice daily until the healing process gains momentum. This remedy is a specific where hemorrhage is concerned, notably where the blood is bright red and is intermittent. Also indicated in retinal hemorrhage. Example Dose: 30c potency, one dose every 15 minutes until bleeding ceases. Useful where there is intraocular hemorrhage where the blood is dark and remains fluid. Example Dose: 30c potency, one dose every 15 minutes until bleeding stops. Will limit bleeding from the eye where the blood is dark in color and remains fluid. It will also aid in the absorption of the clot. Example Dose: 30c potency, one dose every 15 minutes until bleeding stops. 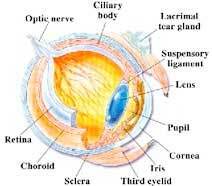 This remedy is useful for the effects of ocular trauma in general but of most value in hastening the absorption of clots in the eye. Example Dose: 30c potency, given twice daily until the clot is reabsorbed. Specifically indicated where trauma has caused massive bleeding inside the eye along with great swelling of the conjunctival membranes. This swelling and conjunctival edema is common in horses, dogs and cats and in the veterinary field it is referred to as chemosis. The conjunctiva is the clear tissue that surrounds and protects the globe (eyeball). It can result from trauma, hypoproteinemia (abnormally low level of protein in the blood), allergic reactions, and insect bites. Example Dose: 30c potency twice daily until the clot has reabsorbed. Damage to the cornea can result in permanent scarring to the eye and impairment of vision or may ultimately lead to ulceration of the corneal surface. Prompt action is always required. Don’t forget the value of Arnica, Hypericum, Ledum and Aconite in dealing with injuries to the eye in general and Euphrasia mother tincture in healing any injury. Consider the following remedies as more specific for corneal damage. A good general remedy for injuries to the eye and in particular to the cornea. Example Dose: 30c potency four times daily. A general remedy to bathe the eyes where sore and inflamed or where the cornea has been damaged. Will help heal any injuries to the eye and reduce the risk of conjunctivitis. Instructions: Dilute before use adding two drops to 40ml of cold boiled water. Bathe affected areas two or three times daily using clean cotton balls. This is a good remedy to help improve the health of the cornea and will assist healing where there is corneal damage. Instructions: Dilute the mother tincture and use as above or use the eye drops as instructed on the pack. Foreign Bodies, sand, dirt, small pieces of straw, chaff, husk or grass awn may occasionally become lodged under one of the eyelids causing damage to the cornea (with possible ulceration) and conjunctivitis. Use appropriate remedies to assist healing after the material has been removed by your veterinarian. Wash out the eye with diluted Euphrasia Mother Tincture or tea made from the herb to afford extra relief and to help flush away foreign material and infection. Use where discomfort persists after the foreign body has been removed as indicated by profuse production of tears and frequent blinking or closing of the eye. The eyelids appear uncomfortable. Example Dose: 6c potency, given two to four times daily. Indicated in similar circumstances to Spigelia, but where the symptoms are less pronounced, notably where there is little tear production. The animal may continue to rub the eye although the offending material has been removed. Example Dose: 6c potency, given two to four times daily.